Taking place from 12pm to 2pm outside the Kelly Strayhorn theater, you’ll hear live music from local artists and dine on delicious fare from one of the food trucks stationed outside the theater. If you’re new the neighborhood, this is an excellent opportunity to meet and mingle with your neighbors. Chat with residents, creatives, and artists, and add a uniqueness to your day only offered in the East Side! Not familiar with the Kelly Strayhorn Theater? Perhaps you’ve seen its intriguing, neon-blue sign, strikingly ablaze against the old, ornate facade. 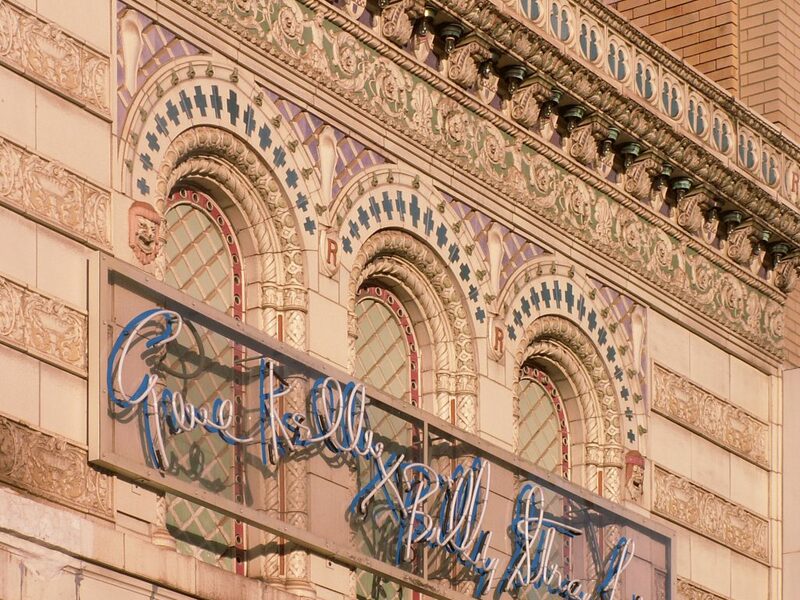 The theater’s name comes from two of Pittsburgh’s most celebrated talents — famed dancer Gene Kelly, raised in East Liberty, and Homewood-bred jazz composer, Billy Strayhorn. To enter the theater, or even to stand in its doorway, is to be in the presence of these artists, whose talent and passions provide inspiration for the community. Their energy — and the theater’s cultural significance as a whole — continues to radiate through the East End community, contributing to the quality of life and development of the neighborhood and the city. This, no doubt, makes a lunch break at Beats n’ Eats all the more meaningful and inspiring. To learn more about the theater’s charismatic history and how it contributions through inclusive and educational activities, visit their site here. Now, go out there and enjoy your neighborhood — no matter the time, no matter the day! Rev up those engines because the Pittsburgh Vintage Grand Prix is here for its 34th year! Yesterday, the PVGP officially cruised into town, starting off the ten days of exciting events and eye-popping vehicles. This is a unique experience that sends a jolt to various locations in the city. Not only that, but since 1983, the PVGP has donated $4.75 million to the Autism Society of Pittsburgh and Allegheny Valley School. And what luck — the PVGP is coming right to our neighborhood! Just a few blocks away on Walnut Street, you can catch the “Walnut Street Invitational Car Show” on Monday, July 10, from 5pm to 9pm. Shadyside makes for a sublime backdrop for such a show, welcoming 125 rare, classic, and exotic cars to the streets of this intimate, thriving neighborhood. You’re guaranteed to see some of the region’s most unique vehicles and, because the cars are selected by invitation only, this show includes cars rarely seen at other car shows. An excellent reason to get up-close and personal! The “Walnut Street Invitational Car Show” is the perfect preview to the PVGP International Car Show occurring five days later, but, before that, there’s another, can’t-miss event in the East Side! On Friday, July 14, catch a thunderous display of 75 to 100 race cars zip through Squirrel Hill. Named “Forbes Avenue of Speed Car Parade and Car Show”, this event is free and open to the public from 6:30pm to 8:30pm, and held in conjunction with the annual Squirrel Hill Sidewalk Sale! Bring the family for an evening of food, fun, and, of course, fast cars. The following weekend brings the final and most-anticipated events of the PVGP — Saturday’s International Car Show and Sunday’s Schenley Park Race Day! On July 15, from 11am to 4pm, Schenley Park will be home to the nation’s largest vintage race event and the only one run on actual city streets. The International Car Show is a combined show of 20 different displays featuring 2,500 cars. Check out the list of car shows here. While exploring the various displays, you can also watch the 150 vintage racers compete on the track all day to qualify for Sunday’s race. As if it couldn’t get any more thrilling, this course is considered to be one of the most challenging courses worldwide! Whether you’re a passionate fan, vintage car collector yourself, or simply looking to enjoy the outdoors with your family, the Pittsburgh Vintage Grand Prix is truly a rare treat.